Please refer to our stock # 1709 when inquiring. 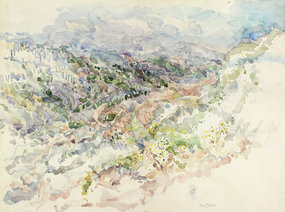 View of Jerusalem Hills, by Eve Menes. 1984, Watercolor on paper, Framed 25 1/2" x 31 1/2". Eve Menes was born in Antwerp, Belgium, and at an early age, after the outbreak of World War II, moved with her family to Brazil and later to the United States. She grew up in New York and received her B.A. in Art and Education at a time of great ferment in the New York art scene. Menes studied Art at Pratt Institute with the Leaders of Neo-Realism, such as Philip Pearlstein, Richard Lindner and Gabriel Laderman. Later she studied with John Heliker at Columbia University. Menes settled in Israel in 1970 where the Israeli light and landscape, so different from what she had known before, had a decisive influence on her art. Since then she has been living and painting in Jerusalem. Eve Menes has exhibited in Israel, the United States and abroad.